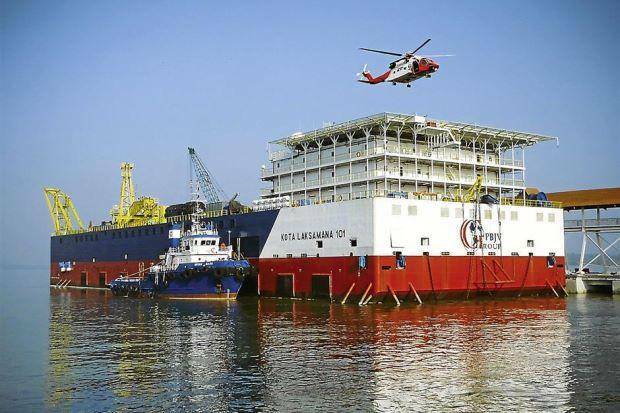 Purpose-built accommodation and pipe-lay barge on charter to Petronas equipped with VSAT and L-Band services. Globecomm Maritime has been awarded a contract to provide VSAT connectivity to PBJV Group’s barge Kota Laksamana 101. Globecomm will provide Ku-Band VSAT connectivity with L-band back-up to the specialist vessel during its deployment in waters off Bintulu. The barge, which accommodates up to 300 personnel, was recently chartered to Petronas, a fully integrated energy company based in Malaysia. Under the terms of the deal, PBJV is required to provide a dedicated 512kbps up and down link to Petronas staff working onboard the vessel. Globecomm Asia Regional Sales Manager Kian Ong, who led the project, says the scope of Globecomm’s solution exceeded PBJV’s expectations, despite intense competition for the contract. Co-ordinating between VSAT specialists in the U.S., The Netherlands and Singapore, Globecomm installed and commissioned the equipment to meet the start of the charter in late April. Although PBJV specified a pure data solution via a single satellite beam, the below decks equipment is also equipped with a VoIP solution. If Kota Laksamana 101 is awarded future charters in locations outside the current coverage, Globecomm can remotely re-configure the equipment to connect to other VSAT satellite operators. En Hisyam Ismail, Assistant Technical Superintendent, PBJV Group Sdn. Bhd says the company chose Globecomm because of its ability to provide a flexible, high quality communications solution. Globecomm Maritime VSAT solutions deliver flat rate monthly pricing, with options including hardware leasing for approved packages and customers, Ku-band unlimited usage and L-band airtime. This core package includes all components and configuration needed to provide the vessel with global seamless connectivity. The service provides both ship and crew with always-on, unlimited bandwidth for business and personal applications, enabling users to maximize the benefits of a maritime broadband connection while relying on dedicated quality of service.